This card is entered into this week's Crazy Crafters Project Highlights. Click here to see the other great projects and vote for your favourites. Stampin' Up have really excelled themselves with all the really beautiful papers in the Catalogue this year and I love them all - but this would have to be my favourite! 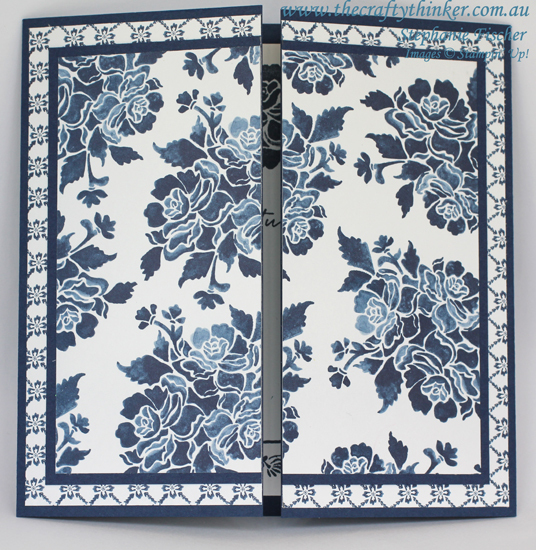 This Floral Boutique paper is simply stunning - it needs very little else! I made this card for my my lovely team-member, Satomi, to celebrate her latest achievements. It can be a bit daunting to make a card for someone so talented - so I whipped out the Floral Boutique Suite (matching paper, stamp set, dies and washi tape) and the card pretty much made itself! I made the 6" gatefold card by cutting a 12" square piece of Night of Navy cardstock in half to 12" x 6" and scored it at 3" and 9". I cut the layers to the size I wanted and then cut them in half. When adhering them, I lined them up against the inside edge so that they would retain the look of square layers on the closed card. For the belly band closure, I cut a piece of Night of Navy card to 12" x 2" and folded it around the card, leaving a small gap at the front. I added a length of Dapper Denim Ruched Ribbon and then covered the gap with the small Night of Navy and Whisper White Layering Squares panel, decorated with Dapper Denim flowers cut with the Botanical Builder Framelits). I added a Dapper Denim bow. I cut my squares of DSP to size and then cut them in half to adhere to the card front. For the inside, I cut a 5.5" square piece of Whisper White card. 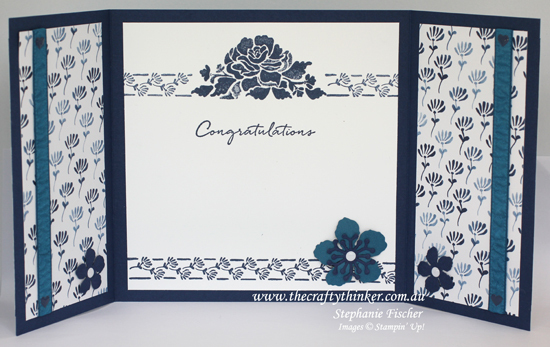 I used Night of Navy ink and stamped with the Floral Phrases stamp set. I stamped the patterned edge at the bottom with full strength ink but stamped off before adding the edging to the top. 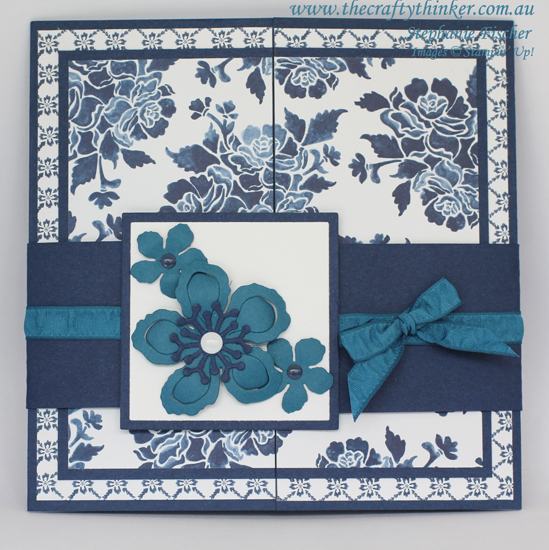 All the papers in this gorgeous DSP pack are beautiful and mix and match so well! I cut more of the gorgeous paper for the side panels - two pieces measuring 5.5" x 2.5". I added a length of the Dapper Denim ribbon before sticking it to the card base. I added a heart-shaped Enamel Shape (in Night of Navy from the Regals pack) to each end of the ribbon and some more Night of Navy and Dapper Denim flowers which White Perfect Accents centres. This card is in this week's Crazy Crafters' Project Highlights - do visit to look at the other great projects and vote for your favourites.